When Sarah’s Hill’s son complained of aching legs, her GP told her not to worry. But it was one of the first signs Alex had Parkinson’s disease, a condition usually associated with the over-60s. Alex Hill was just eight years old when his mother first thought there might be something seriously wrong with him. Sarah noticed he complained about his legs hurting for days after taking part in a PE lesson. She had already spotted that he dragged one leg when he was tired. “I thought that wasn’t right for a young child,” she says. She took Alex to her GP in Folkestone who told her there was nothing to worry about. But Alex developed more odd symptoms. “He didn’t want to leave me, even though he loved going to school. He also became quite obsessive. He had to pack loads of pairs of underpants in his bag and we weren’t allowed to leave the house without them,” Hill says. On another day Alex opened his bedroom window and shouted at the birds to shut up. A few months later Sarah was talking to her son when he suddenly fell flat on his back. He couldn’t explain what had happened. His handwriting had deteriorated and Sarah’s father had also noticed Alex had a slight tremor. He wondered whether it might be Parkinson’s, but the GP laughed at the idea. Alex was referred to a local paediatrician, who decided to treat him for epilepsy. However, the medication made no difference and within months he was falling up to 28 times a day. “He couldn’t sit down because he was so bruised and would have to lie on his tummy,” Hill says. He was finally referred to the Evelina Children’s Hospital in London. Within a day the specialists there diagnosed Alex with juvenile-onset Parkinson’s disease. A brain scan revealing low levels of the chemical dopamine confirmed it. For Sarah Hill it felt like “falling in to a black hole”, although she reassured her son they would deal with whatever happened. Some 120,000 people have Parkinson’s in the UK, with the majority diagnosed over the age of 60. About 5% experience symptoms before the age of 40, but it’s very rare for people to be diagnosed under the age of 20. After viewing some home videos, doctors said Alex had shown signs of the condition at the age of three, but they could not explain why he had developed the disease. Neither Hill nor Alex’s father had a family history of Parkinson’s. Alex was put on the drug Levodopa, which acted like “rocket fuel”. “It was good for getting him moving but it made him a bit manic. I had to hide phones in the house as he kept calling the police just to talk to them,” Hill says. She gave up training as a fitness instructor to become Alex’s carer. There are more than 40 symptoms and these can include vomiting as the body struggles to process food in the gut. Parkinson’s can also affect a person’s mood which may explain Alex’s shouting out. Often a person will feel they have got to grips with their condition then a new symptom will emerge and because it is so varied, there is not one treatment for every symptom. Areas of research showing promise include stem cell treatment and gene therapies, but more work is needed. We know that people under 40 can often struggle to get a diagnosis because juvenile Parkinson’s is so rare. However, Parkinson’s can affect people of all ages. It is vital that professionals look at the symptoms a person has, rather than making assumptions based on their age, so people get the right diagnosis, first time. By the time he was 12 he was mostly using a wheelchair. He found it hard to be around his old school friends, who could still run about. He eventually moved to a school for children with special needs, but found the teaching level too low. After a couple of years, Alex stopped responding to his medication so when he was 14 he underwent deep brain stimulation. In this procedure electrodes are implanted in the brain, which deliver high-frequency stimulation to targeted areas. The surgery reduced his tremors and “gave him back his smile”, Hill says. Alex moved on to another school in Sevenoaks, which helped him study for his GCSEs, using a computer talking board. He wasn’t able to continue his education, but still enjoys learning. “He loves sciences and likes to catch up on some Maths and English,” Hill says. As Alex’s condition slowly declined, Hill began to feel she couldn’t cope. “I felt like I was fighting Parkinson’s on my own because at Alex’s age it’s so unusual,” she says. “I asked about prognosis and was just told to keep him as fit and healthy as I could. Hill decided the best decision – for her and Alex – would be for Alex to move to a care home down the road. “It means I can be his mum again, not just his carer. We can play games and have fun,” Hill says. Alex remains fully involved in family life, attending family barbecues and events like his sister Becky’s wedding. “He had a wonderful time. It wouldn’t have been the same without him,” Hill says. Alex is fed through a tube in his stomach as he struggles with swallowing and he often finds it difficult to sleep, sometimes shouting out. He needs assistance for most things and has a close bond with two workers at the home. His mother visits every other day and makes video calls in between. Now 24, Alex doesn’t want to talk in detail about his condition although he says losing the ability to walk was the toughest challenge. “Alex doesn’t like to relive his experience. He’d rather focus on having fun times now, which is a really good way to be,” Hill says. His interests now include “films like Harry Potter and TV shows like Doctor Who”. He also enjoys painting. “He can’t really play his XBox now but he likes to watch me play it and point out how I’ve gone wrong!” Hill says. 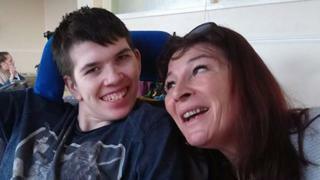 Alex describes his mother as “the best mum in the whole wide world”. They are hoping to go on holiday to Wales this summer. A father from Texas realised there were no theme parks where his disabled daughter could play. So he decided to build one.